Hotel Alpina is situated in Alta Valtellina in the heart of the Rhaetian Alps, in the little village of Premadio, merely 2 km from Bormio. It is very near to the ski slopes, to the renowned hot springs spas of Bormio, of Bagni Nuovi and of Bagni Vecchi, as well as being only 35 km from Livigno (duty -free area). Ideally it is a family hotel, but also caters for organised parties and sporting groups, offering the comfort of rooms with an en-suite bathroom and balcony, sitting rooms, a bar and restaurant, a solarium terrace, wi-fi and television. 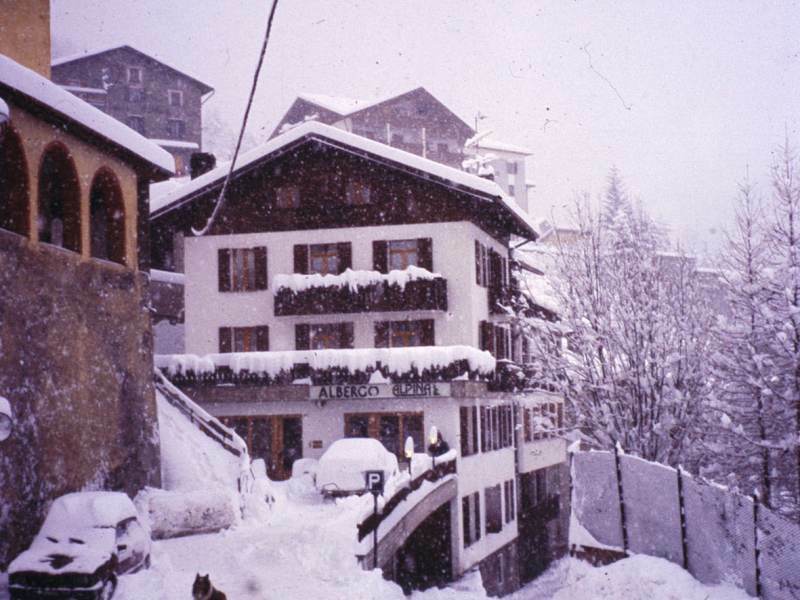 Hotel Alpina, run by the Pienzi family, has always set itself apart for its hospitality and family atmosphere, which makes any holiday so much more pleasurable and relaxing. To fulfil every client's requirements , Hotel Alpina offers the possibility of booking either with “full board”, “half-board” or even “ bed and breakfast”. The restaurant daily offers the best recipes of our traditional Valtellinese cuisine, as well as more classic, yet tasty national dishes. Every warm and welcoming room has a private bathroom, a balcony and a television, in the lounges you can access a free wi-fi zone or watch the television in front of the fireplace, sipping a glass of good local wine or a national liquor. Hotel Alpina provides an external parking lot for motor vehicles and offers a storage service for motorbikes, bicycles and ski equipment in a private locked garage. Through Hotel Alpina, you can book your hot springs spa stay, the Ski Schools, the Husky Village excursion and also the seasonal touristic services like touristic tours, bicycle excursions, ski pass and many more. From Hotel Alpina, you can not only very easily reach the centre of Bormio, the surrounding area's ski lifts, the sports facilities, the thermal spa facilities but also the touristic destinations in the area, like Livigno, St. Catherine Valfurva, Tirano (where the famous little red train for St. Moritz departs from) and many other areas or valleys, which are the starting point for numerous alpine refuges and shepard's outposts in the area.